What does “Landscape Industry Certified” mean? When you hire an ALCC member, you get a company that is better by nature. ALCC members are companies that strive to improve the professionalism of their businesses and their employees in order to provide better service to customers. All ALCC members are asked to adhere to certain Standards of Conduct and to perform their work according to recognized industry standards. As part of their commitment to professionalism, many companies have Landscape Industry Certified Technicians on their team. To achieve this designation, an individual must demonstrate a level of industry knowledge and technical ability set by the National Association of Landscape Professionals (NALP). When an individual earns certification, it demonstrates that he or she knows certain landscape concepts and can perform a variety of industry tasks to specific standards. Individuals may become certified in one or all five areas in which certification is offered. To maintain their designation, Landscape Industry Certified Technicians must participate in continuing education on a regular basis. When you use ALCC’s Find a Landscape Pro search, companies with a Landscape Industry Certified Technician on staff are marked in search results. ALCC is licensed by NALP to administer certification testing in Colorado. 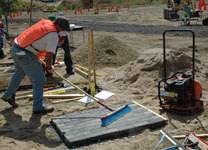 To learn more about becoming a Landscape Industry Certified Technician, click here. Thank you to our 2017 Test Sponsors!